After the Paris concert at En Marge, we went on to Amsterdam where Mazen had a residency at Steim. Playing in duo with Mazen is always very easy and efficient, and our purpose was to finally get a chance to record it in a good studio, so hopefully we have enough material for a future release. We also had the chance to work extensively with Australian harp and guzheng (chinese string instrument) player Clare Cooper who's sound world is surprisingly highly close to ours. An acoustic (a very rare event for Steim) trio set we did was also very intense. 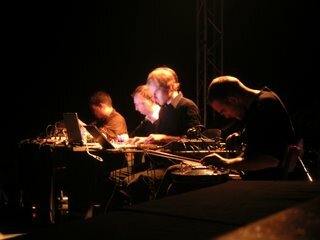 For the second time after Sweden we could also listen and perform at greater length with Michel Waiswisz (someone we knew through his 70s recordings with Steve Lacy among others) amazing use of electronics, a true pioneer in the field and probably the first to have found an efficient way to combine electronic music with physical movement. One of the most important encounter for me was with our compatriot Tarek Atoui, someone I had heard a lot about but had only very briefly listened to. Here I got a chance to discover his very interesting work. He is not clearly an improviser as the rest of us and works a lot with patches and composed electronic music with his laptop (MAX/MSP). A very abstract sound world, very contemporary, an overall experimental approach and a dedication to make new music outside of the mainstream paths of regular Lebanese artists. Even his use of occasional beats are quite special and subject to breaks and asymetrics. It is rare for us to find Lebanese artists who have developped such original work without any prior contact with our MILL events or Irtijal. So a great pleasure, hopefully with time and common work we will find ways to make some unique music together. "Moments Remuements" are a series of concerts organised by the Es Muss Sein association quite regularily for about a year now. They take place in a workspace inside organiser Gregory Castera's own appartment. It is quite an ideal space for acoustic concerts, very intimate, allowing the sound to be grasped in its full extent. The audience is limited to about 20 and the general level of listening is optimal. 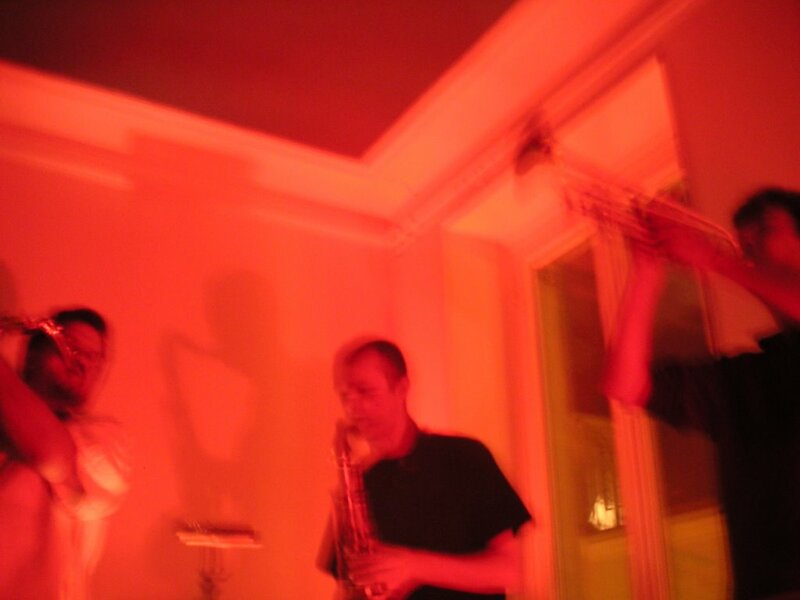 On this night we enjoyed a straight forward 45' set by Vortex, a duo now on tour in France and Switzerland who where about half way in their trajectory, composed of Heddy Boubaker on alto sax and Sébastien Cirotteau on trumpet. Here they had Bertrand Denzler on tenor sax as a guest. Immediatly we feel the complicity of Vortex, a harsh mixture of breath, whistling, gurgling, growling with a few floating overtones or multiphonics from here and there. Denzler fits in quite smoothly, delivering some of his unique low frequency ostinatos, space filling overtones or soundwaves, sometimes taking a very supportative role to the ongoing duo surrounding him. For the first and major part of the concert the three of them manage to move together, sometimes going back to silence to wait for a sound that will trigger the construction of a dense soundscape. In the second shorter part the playing became more sparse and delicate, at one point you would feel that this is the end, while in fact another movement is set in motion, and silence becomes a constitutive part of the music. Some of the best moments actually happened in the end with very precise sounds from low volume to short white noise type breath with occasional single tones or percussive sounds producing some quite improbable combinations. Makes me wonder how much sound we loose in bigger performance spaces, this one is most probably the smallest space I was given to perform or hear concerts in, and everytime I am surprised by the quality of sound that feeds both the playing and the listening. Mazen Kerbaj will be in Europe for a very short time and only 2 concerts, he is preparing for a longer residency in STEIM in Amsterdam next year. We will also have a chance to finally record our duo in optimal conditions in the STEIM studios. For those of you who worried, or wonderred: Jack arrived at 6a.m (with an overall 16h delay from his initial schedule!! ), fortunately we heard him, he slept a few hours, then left at 1p.m to catch another flight to Oslo. One good news: he has released the Beirut "Irtijal" solo gig along with a Barcelona solo on his label Spring Garden Music under the name "As Is". This is only the second release of an Irtijal performance after the Brotzmann/Zerang "Live in Beirut" CD on Al Maslakh. 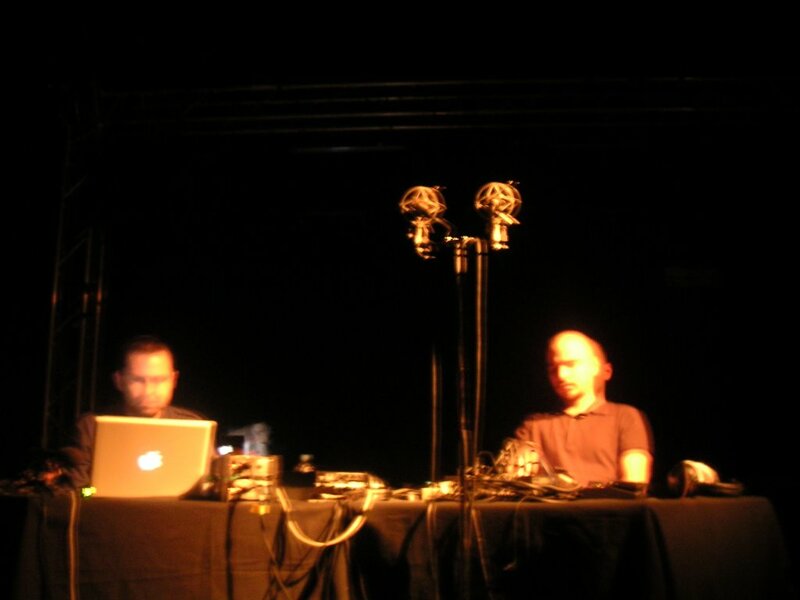 Most of the Irtijal recordings are actually safekeeped for a future boxset release that will include material from more than 5 editions of the festival. It's 2 o'clock in the morning and I'm waiting for Jack Wright who was supposed to be here at noon today but his plain got delayed by 14h!!!!!!!!!!!!!!! Apparently there has been some more wasted time otherwise he would already be here. He will only stay overnight and leave tomorrow morning for a five week tour in northern and eastern Europe mostly in solo, then in France with a trio. Being here with nothing to do except wait for him I thought I'd make this post to express how impressed I am with his unlimited energy I rarely see with musicians from his generation. Musically he has moved from free jazz in the eighties (that got him the funny label of "only white man who can blow his horn like a black man") to so-called "reductionist" music in the nineties. Seeing him play today shows that he didn't take his mark in any of these styles, he can lay waste to all his prior knowledge of the saxophone and give the impression of experimenting like a newby, putting himself at total risk. 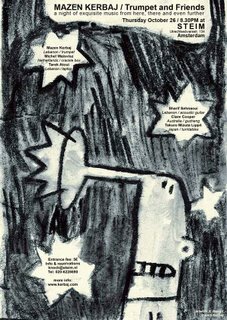 He performed a wonderful solo in last year's "Irtijal" that frightened most of the audience and shocked the other half, it was just raw, unpolished, unthought blowing into the horn producing the most unique squeaks & growls. I try to think at how many times he might have settled down into a clear recognizable style throughout his life, playing his regular tricks and techniques as many musicians do after a while (and I don't condemn that), but no, it seems everytime I see him he is working from scratch again in a gesture that makes him one of the only true improvisers I know. Four musicians engaged in the very difficult exercise of a quartet improv meeting with our friend the neighboring binary rock drummer (did I mention he was also a pretty bad binary rock drummer as well?). Quentin Dubost is someone I know quite well, we have both shared a long term relation of reciprocal influence, and in many ways he is one of the most underrated french musician. 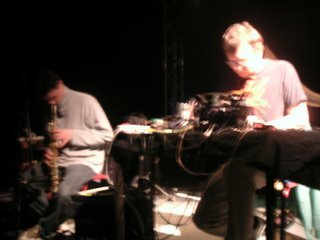 Matthieu Saladin I have known better as an amplified/processed bass-clarinet player, but here he was playing laptop. Boris Baltschun is also a musician I've shared beautiful experiences with in the past and highly estimate his work. It was the first time I ever hear Thomas Korber but didn't get much of a chance to focus on his work. 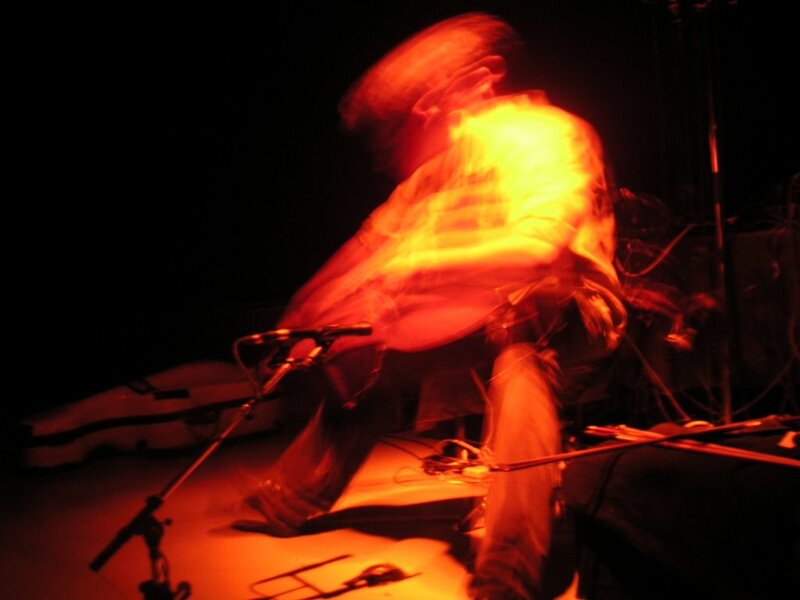 The first half of the concert was a head on four way improvisation that worked quite well, producing a dense structure of superimposed layers through which we could appreciate Dubost's unique arco palying on his Les Paul guitar. The second half slowly degraded towards a loose ending. The separation point between these 2 parts was the first time they reached silence and that we had to have our now usual drumming break (sorry to insist), after which things didn't build up again. Not an armenian duo despite the name :-) Actually this was a first time meeting between frenchman Hervé Boghossian here on laptop & german Serge Baghdassarian playing electronics. Both have their own sound worlds that I find did not totally meet on this occasion. Baghdassarian develops a wide array of low frequency roars, crackles, high pitches, overtones, and oscilating concrete type sounds, in general lacking any tonality. 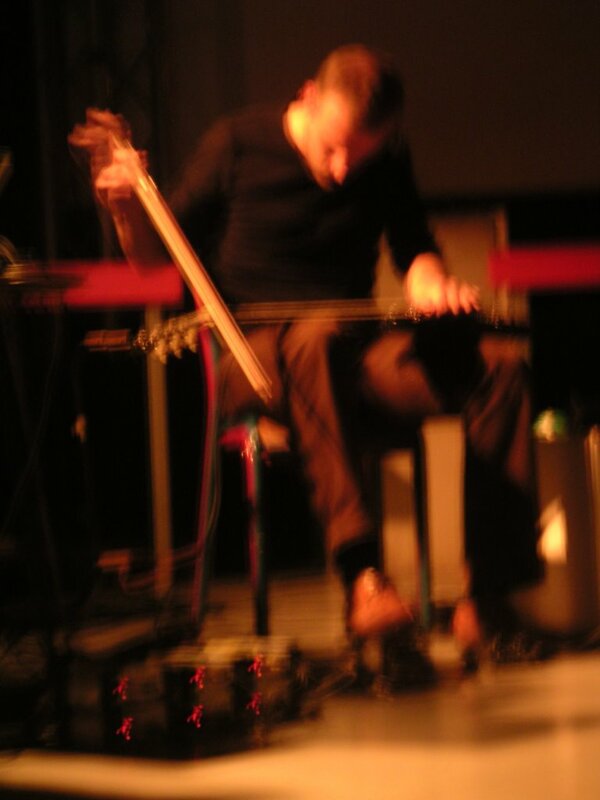 On the other hand Boghossian develops sound waves and combos that also generate clear tones. In general he navigates within several medium or medium-high waves, tones and oscilations that did not mix with his partner's drier universe. Both very intersting artists but somehow the meeting didn't really happen. The neighboring drummer (see previous post) also had a great part to play in this. Day 2 of the Audiofocus festival was a very controversial experience for me due to the degradation of the local playing conditions compared to day 1. In general there is always the sound of a loud buzzing fridge that the venue refuses to turn down, but on this day you had to add the constant sound of a drummer rehearsing binary rythm in the neighboring room (!!!!). For those of you who know the high level of focused listening to apreciate and grasp the full extent of these kind of sound creations it's no surprise that a constant muted drummer spoils the whole experience of abstraction into sound, breaks all possibilities of a true silence and destroys subtle low volume textures. The Mains d'Oeuvres venue is for me a place to avoid at all cost as I had these kind of events everytime I went there (unless you are inclined to like a Burckhard Beins solo mixed with an electric bassist rehearsing Nirvana lines for example). The manager of the venue has no decency or respect for the artists (some of which travelled a long way to get there), trashes all possibilities to complain, and almost despises them when he himself complains because someone disturbed a dance rehearsal by doing the mistake of taking a wrong turn and going into the wrong door (a disturbance that barely took a few seconds to disappear while we had to endure the binary rythm and the fridge buzz throughout). I felt the musicians where being insulted and equally myself as an audience. However just before the drummer started his lonely next door show, we had the chance to calmly listen to Thomas Charmetant playing a cello solo. I've known Thomas for quite some time now and a trio with Christine and him was one of my first ever bands and gigs in Paris. But for me on this day was his best performance ever (that I saw of course). Very clear start, with simple gestures producing a fantastic acoustic drone. He then moved to a very intuitive approach to improv, moving from one sound to the other, superposing ideas, producing circular gestures that slowly evolve with time, keeping it very simple and clear. Absolutely no cello clichés. An overall very courageous improvisation stance that we rarely see in a solo setting, at least not with such efficiency. Short but great! 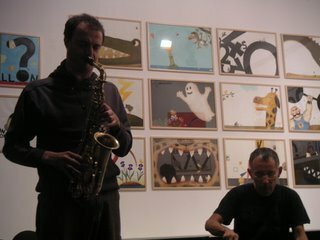 The second concert I saw featured my old time partner & inspiration Stéphane Rives in a first time duo with Jean-Philippe Gross. Since the very first seconds they are already totally into the music, starting with a high pitched frequency mix with Rives unique soprano work in this range (check out his Potlach album Fibres!!!). The rest is a formality, amazing interraction in an overall high volume, beautiful dynamics, fully masterred art of loops & syncopation, the sound often filling the whole room, spiralling around our heads & creating weird acoustic phenomenons deep inside our ears. The concert ends as it started, way up! 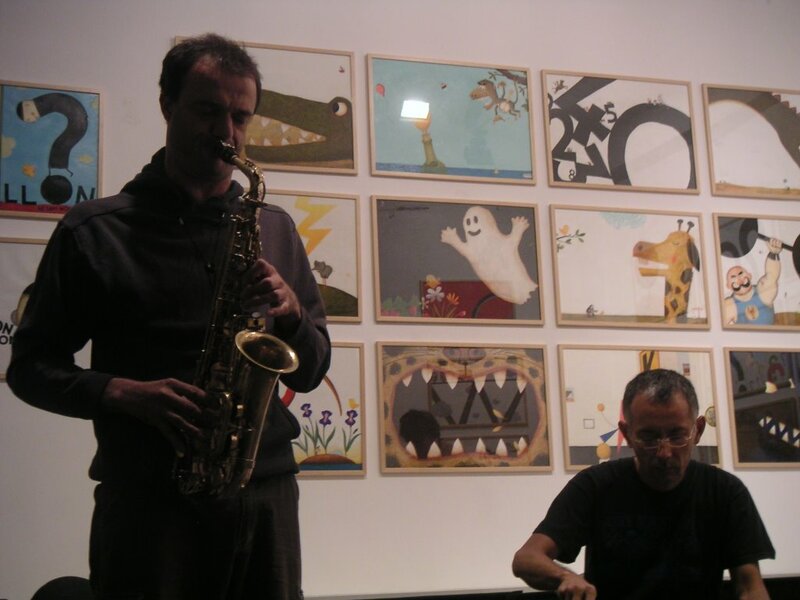 Two concerts featuring improvised music will take place in Beirut this october. This is very special news to me since they are the first ones since the "july war". 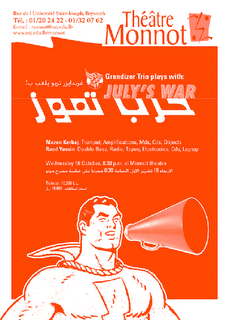 In a way it is the rebirth of the Lebanese improv scene in Lebanon after it was forced to shut down on july 14 when we had to cancel a Moukhtabar Ensemble + Ricardo Arias & Stéphane Rives concert. Extended thanks to Charbel, Mazen & Raed for making this happen. First gig I attend in Paris in a long time (more than a month), was actually very happy to be there. I've known Jean-Luc & Seijiro for a long time but it's the first time I see them in duo.